The nature of e-learning in Australia | Spark Your Interest! The young nation of Australia has a rich history in e-learning. They say necessity is the mother of invention, and so in 1951 the School of the Air was launched to educate children dispersed across the outback. From Kalgoorlie in the west to the aptly named Longreach in the east, school students in remote communities received their instruction over the radio. Fast forward to today, and our love affair with communication technology continues unabated. According to the latest Australian Mobile Phone Lifestyle Index, a whopping 76% of Australians own a smartphone. Furthermore, 38% own a tablet, and another 33% are planning to purchase a tablet within the next 12 months. Our love for our devices may be matched by our infatuation with social media. According to the 2012 Yellow Social Media Report, 62% of Australian internet users visit social networking sites (36% do so daily), while 79% of large businesses have a social media presence. The implication of these statistics is clear: the future of e-learning in Australia will be social and mobile. In order to complement these findings and add a corporate perspective, I recently invited 20 e-learning practitioners based in Australia, from both the higher education and corporate sectors, to identify the ideas and technologies that their respective organisation’s e-learning strategy will incorporate this year. In the list I included the four imminent technologies identified by The New Media Consortium, plus others that I considered timely or likely. I also allowed free-form comments to enable the respondents to add any other technologies that weren’t on the list. The results are summarised by the following graph. 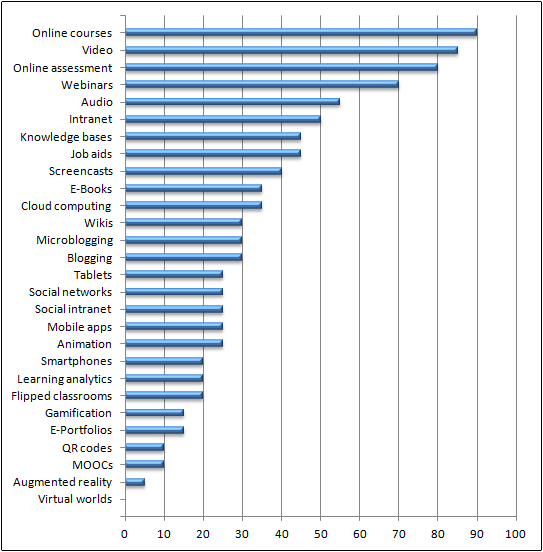 As you can see online courses will remain a popular component of e-learning strategies in Australian organisations in 2013. My interpretation of this result is that in this country, industries such as financial services are heavily regulated by legislation and government oversight. From the company’s point of view, the most efficient way of deploying the necessary training to its employees (particularly in large organisations) is via online modules hosted by the Learning Management System. Critically important for compliance purposes, the LMS records each employee’s performance in each module; which no doubt explains why online assessment is similarly popular.The popularity of online courses and online assessment does not necessarily mean that Australians will be subjected to boring page turners. The strong showings of both audio and video in the results suggests that online training is becoming more multimedia rich, and hopefully more engaging and authentic. The prevalence of webinars also suggests that much of the training done online will be live. The next most popular responses — intranet, knowledge bases and job aids — represent a win for informal learning in this region. At my own workplace I have witnessed a tectonic shift from the traditional, classroom-based transmission of knowledge towards a more constructivist, self-paced approach involving the searching, exploring and discovery of knowledge by the learner on-the-job and just-in-time. Given the increasing importance of cloud computing in this region according to The New Media Consortium, its relatively poor showing in this survey was surprising. My interpretation of this result is that the security of cloud-based solutions remains a concern for Australian IT departments, over which e-learning professionals have very little influence. The persistence of legacy systems may also be hampering growth in this direction. Similarly, the relatively poor showings both of the social elements — wikis, blogging, microblogging, social networks and social intranets — and of the mobile elements — smartphones, tablets and mobile apps — were a surprise. However, another way of translating these results is to recognise that each will be a component of at least 1 in 5 e-learning strategies this year, which probably represents growth over previous years. The same may be said for learning analytics (another of The New Media Consortium’s imminent technologies for this region). From an anecdotal perspective, I can honestly say that I don’t know anyone who does evaluation well! In the rat race that is Australian business, the jobs that are yet to be done take precedence over those that have already been and gone. The observation that learning analytics will be a component of at least 1 in 5 e-learning strategies this year may be a long-overdue sign that the mindset is beginning to change. The most disappointing result in my opinion is that of MOOCs. Buzzword or not, MOOCs provide an unprecedented opportunity to source high-quality content from some of the world’s most respected institutions. However, I must temper my disappointment with the realisation that most MOOCs currently target school and college students. As more MOOCs are launched covering topics immediately relevant to the corporate sector, I expect they will become more popular. Of course, I must also remember that my survey is hardly scientific. The sample size is too small to make statistically significant observations, which is most obviously demonstrated by the zero result for virtual worlds. I know for a fact they are being used by Australian organisations such as the Sydney School of Medicine. Nonetheless, I submit that this simple survey sufficiently describes the nature of e-learning in Australia as we head into 2013. While online courses and webinars continue to dominate our strategy, informal learning is making headway. To a lesser extent, social and mobile elements are also making an appearance. But for such a social and mobile nation, the message is clear: there is scope for so much more. When we look at the usage of e-learning technologies, it is important that we are not mixing up the e-learning technologies that are for research purposes and those as addressing the demand from the market. For example, when we see an educational and training institution using a technology for their programs, we should ask if they are spending money on testing it out, and if they are benefiting from the implementation on an on-going basis. It is one thing that an e-learning technology is simply used by an organisation; it is another that an e-learning technology is creating the benefit that the end users respect and are willing to pay for. It is one thing that an e-learning technology is initiated in an organisation; it is another that the implementation is accepted across the organisation in the long run, from financial, operational and clients’ perspectives. Thanks for the post. As on your side of the pond, corporate-focused MOOCs are key to take corporate elearning to the next stage here in the US. It’s interesting to see the variation in your benefits survey responses. Even if it’s a matter of semantics, these keywords represent a fairly unified message when you consider the benefits of elearning. I think a MOOC design could deliver most of what they’re looking for. An ideal MOOC combines sources seamlessly, delivering exponential benefits through integration with social media and mobile devices. A MOOC designed to guide ad-hoc, group-initiated research and contributions would be an engaging learning experience aimed at a corporate audience. Strategically-designed corporate MOOCs will be increasingly in demand. After all, corporate learners are increasingly digital-native. Thanks Richard and Guy, I agree with you both!